Despite a recent legal setback in which Maritrans was denied its motion to classify the mandatory double-hulling of tankers as a "taking" of its single hull vessels, Maritrans continues to be one of the more progressive U.S. owners in ensuring that its fleet of vessels will be up to code to meet OPA 90 demands. 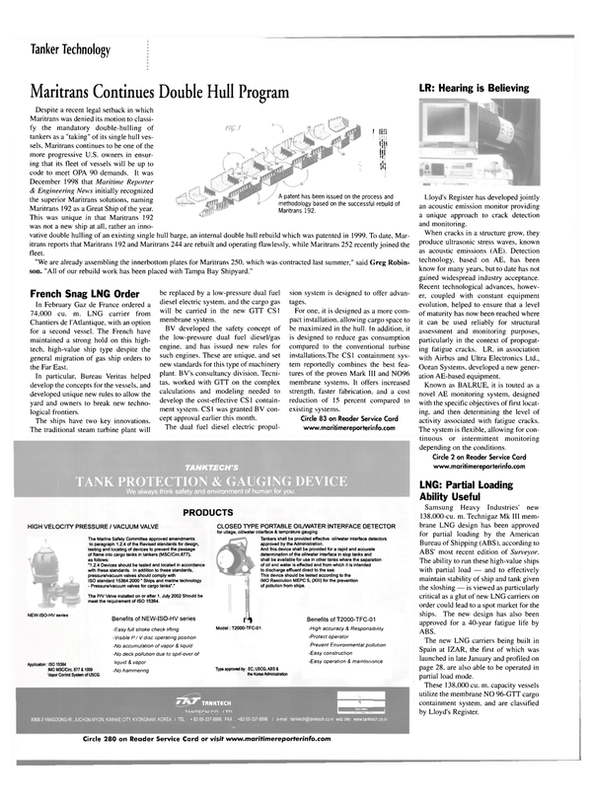 It was December 1998 that Maritime Reporter & Engineering News initially recognized the superior Maritrans solutions, naming Maritrans 192 as a Great Ship of the year. This was unique in that Maritrans 192 was not a new ship at all, rather an innovative double hulling of an existing single hull barge, an internal double hull rebuild which was patented in 1999. To date, Maritrans reports that Maritrans 192 and Maritrans 244 are rebuilt and operating flawlessly, while Maritrans 252 recently joined the fleet. "We are already assembling the innerbottom plates for Maritrans 250. which was contracted last summer," said Greg Robinson. "All of our rebuild work has been placed with Tampa Bay Shipyard."